11.02.2011 » Cristiano Ronaldo: "We all have an oportunity in life"
Cristiano Ronaldo decided to leave a message to all of those who pursuit the dream of becoming a professional football player. CR7 says everyone gets their chance and it's necessary to always believe in it. In the second part of the interview Cristiano Ronaldo granted to Cadena Ser, CR7 took the chance to leave a message to everyone who dreams about becoming a football player in future. He talked about sacrifices and ambition. Ronaldo: "In life we have to always believe and feel we can become a professional football player. If we work hard and a lot, we can get anywhere we want. We all have a chance in life and we have to believe in it." The portuguese forward also confessed that the most difficult stage of his life was when he had to move to Lisbon, when he was a young kid, in order to play for Sporting Clube de Portugal. 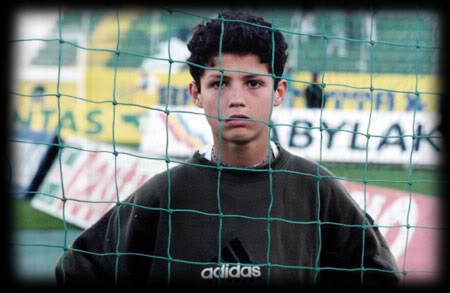 Ronaldo left his family back in Madeira in 1997, to pursuit his dream: "It was very painfull. I had to leave behind all the people who loved me and going to an unknown place was very hard. But I'm also very thankfull to my family, for not "cutting my wings" and allowing me to be the person I am today." Cristiano Ronaldo also talked about a recent issue brought up by José Mourinho a few days ago, related to the ammout of faults and tackles the portuguese forward is victim of. When suggested that his height could be the reason for the different treatment he gets from defenders, when compared to Lionel Messi, Ronaldo said: "Maybe. I'm not going to say I suffer more faults or tackles than Messi, and that defenders hit me more than they hit Messi. But if you take a look at my legs... Anyway, it's normal and I'm used to it already. The expert analysts know how to read matches and they understand what I'm saying." Regarding the insults that Cristiano Ronaldo is forced to hear in most matches he plays in Spain, CR7 said: "I don't need people to provoke or tease me. I always play with ambition to help my team and score goals."